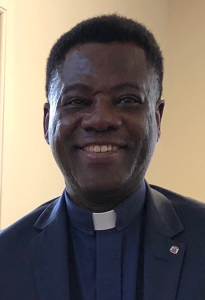 Father Francis was born in Awaso, Ghana ,and is an alumnus of the Minor Seminary-St. Hubert-Kumasi after which he attended St. Paul's Seminary in Accra (Ghana's capital) from 1989-1992 and received a diploma in Philosophy. Immediately following St. Paul's, he was accepted to and began formation at the Major Seminary-St. Peter’s Regional Seminary, Cape Coast in 1992. Father Francis was ordained a priest on July 20, 1996. He spent his first priestly assignment as Associate Pastor at St. Patrick’s Parish in Half-Assini from 1996-2000. From 2000-03, he served as hospital chaplain at St. John of God Hospital in Sefwi-Asafo. From 2003-2012, he was Pastor of St. Anthony’s Parish in Sefwi-Oseikojokrom. And, most recently from 2012-2016, he was Pastor of St. Peter’s Parish in Sefwi-Asawinso. His immediate family includes two brothers and one sister who are still living in Ghana.